Mini-Bak Twist-Free Badge Reel With Swivel Clip And Vinyl Strap - 25/Pkg. Item#:509-MF - These Twist-Free premium badge reels are Made In The USA and feature a Vinyl Strap and Swivel Clip. These durable badge holder reels have been tested in excess of 180,000 Extension Cycles, and the Three-Strand Nylon Cord Extends 36". The solid construction and precision spring-loaded reel ensures a long lasting badge reel and the Twist Free feature keeps the badge facing forward. - 25/Pkg. Mini-Bak Twist-Free Badge Reel With Belt Clip And Vinyl Strap - 25/Pkg. Item#:505-MF - These Twist-Free premium badge reels are Made In The USA and feature a Belt Clip and Vinyl Strap. These durable badge holder reels have been tested in excess of 180,000 Extension Cycles, and the Three-Strand Nylon Cord Extends 36". The solid construction and precision spring-loaded reel ensures a long lasting badge reel and the Twist Free feature keeps the badge facing forward. - 25/Pkg. Mini-Bak Badge Reel With Slide Clip And Vinyl Strap - 25/Pkg. Item#:505-MB - These premium badge reels are Made In The USA and feature a Vinyl Strap and Belt Slide Clip. These durable badge holder reels have been tested in excess of 180,000 Extension Cycles, and the Three-Strand Nylon Cord Extends 36". The solid construction and precision spring-loaded reel ensures a long lasting badge reel. - 25/Pkg. 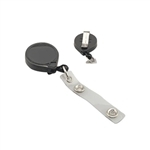 Mini-Bak Badge Reel With Swivel Clip And Vinyl Strap - 25/Pkg. Item#:509-MB - These premium badge reels are Made In The USA and feature a Vinyl Strap and Swivel Clip. These durable badge holder reels have been tested in excess of 180,000 Extension Cycles, and the Three-Strand Nylon Cord Extends 36". The solid construction and precision spring-loaded reel ensures a long lasting badge reel. - 25/Pkg. Mini-Bak Twist-Free Heavy Duty Spring Badge Reel With Belt Clip And Vinyl Strap - 25/Pkg. Item#:505-MF2 - Twist-Free feature keeps ID facing forward. These Heavy Duty Spring premium badge reels are Made In The USA and feature a Belt Clip and Vinyl Strap. These durable Dark Gray With Black Tear Drop badge holder reels have been tested in excess of 180,000 Extension Cycles, and the Three-Strand Nylon Cord Extends 24". The solid construction and precision spring-loaded reel supports up to 4 oz. ensuring a long lasting badge reel. - 25/Pkg. Mini-Bak Heavy Duty Spring Badge Reel With Belt Clip And Vinyl Strap - 25/Pkg. Item#:505-MB2 - These Heavy Duty Spring premium badge reels are Made In The USA and feature a Belt Clip and Vinyl Strap. These durable Dark Gray and Black Tear Drop badge holder reels have been tested in excess of 180,000 Extension Cycles, and the Three-Strand Nylon Cord Extends 24". The solid construction and precision spring-loaded reel supports up to 4 oz. ensuring a long lasting badge reel. - 25/Pkg.